You don't need a sewing machine to make sock dolls for gifts or for decorations -- you don't even need a pattern. Most of the sewing on a sock doll is best done by hand. These folk art dolls are fun and safe for small children. 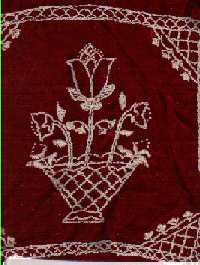 They bring a smile to the maker as well as the child, and you can add expressions with embroidery or fabric pen. We used some old socks, quilting thread (it's stronger than regular thread), embroidery thread, a tapestry needle to make sock dolls for the two new babies in our family. We stuffed the dolls with cotton quilt batting so the babies won't be able to get hurt on the interior in case they get them apart. 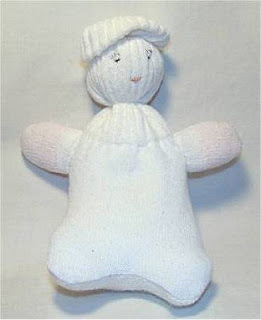 You need two socks to make a sock baby that has a light-colored face and dark-colored body. Cut the toe off the light-colored sock about 4 inches up. Run a gathering thread with a running stitch and quilting thread around the cut area, but leave it open. Stuff the opening with cotton or whatever you have available that is safe for a child. 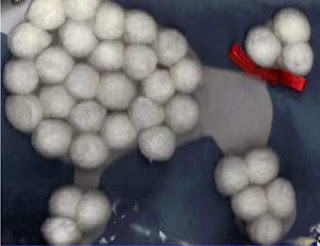 Some children are allergic to Fiberfill. Stuff the sock so the cheeks are cheeky and the head is smaller at the top than the cheeks. Pull the thread to gather the head. Cut the dark sock straight across at the heel. 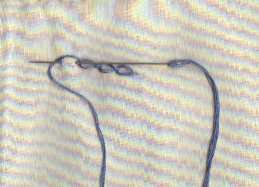 Hand stitch with a backstitch from the bottom up in the center to make legs. Sew a running stitch around the top for the neckline. Stuff each side of the legs and the body. Pull the thread to gather the neck. Match the size of the neck and the bottom of the head with gathers. Stitch by hand to join the head to the body. Backstitch from the neck part of the way down to form an arm on each side. Stitch eyes and a mouth with embroidery thread to give the little guys some personality. Use the top of the dark sock for a hat. Sew across the top or gather it on the wrong side and turn right side out. Stitch the hat to the head to keep it from getting lost. A single white sock can make a small doll. Imagine the sock heel as the doll's behind. Turn the sock wrong-side out and stitch a soft curve for feet. Cut the center piece between the feet to use for arms. Make arms in a closed tube shape and stitch around the edge. Turn the stitching to the inside and set the arms aside. Turn the sock back to the right side and stuff to a couple of inches above the heel. Use a running stitch with quilting thread to make a gathering line for the neck. 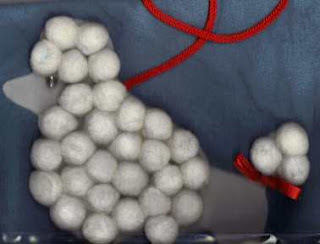 Pull it tight and use a strand of dental floss on the outside, knotted and ends cut short, to hold it tight. Stuff the head with more cotton or stuffing. Leave about 1 1/2 inches of sock at the top. Use quilting thread and a running stitch in another line around the top of the head for gathers to close the top of the head. Tie the gathers with dental floss and turn the top down to create a hat. Place a small amount of filler in the arms. Turn the fabric edge inside and stitch the arms to suitable spots on each side of the body of the doll. 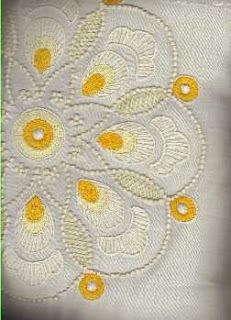 Embroider eyes and lips. Your little sock doll is light-weight and easy for a small child to handle. We hope you enjoy a wonderful holiday season and that your new year holds pleasant surprises and lots of crafting. If you aren't deep in the mire of Christmas crafts, you are losing valuable time. Crafts are personal gifts and although you think it's easy, crafting is not easy for those with no interest, desire or talent. This may describe your relatives or friends that you buy for each year. This year, save some money and spend the time it takes to make something personal. Choose colors you know the person likes. Whatever your project, favorite colors matter. Use colors in the home for a project for the house, or favorite colors for a personal item. Starting with favorite colors makes the item special to that person. Choose a design that speaks to her (or him). If you give a gift, you know enough about the person to express her style. You know the kind of dog she has, her favorite flower, or her favorite season. Make something usable. Whether displayed in the home or a personal item, make a usable item. A fleece throw in an appropriate color for the individual or house, decorated by you with embroidery of a favorite animal is an example of something your friend or relative should appreciate as a Christmas gift. Fleece is reasonably priced and easy to work with. 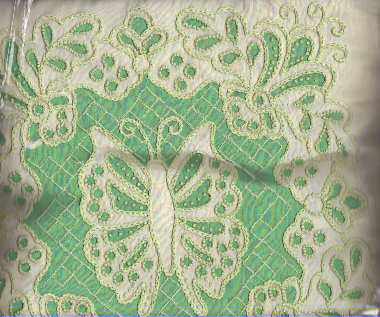 You don't have to do much sewing as it doesn't fray, and the blanket or buttonhole stitch is suitable for finishing the edge. 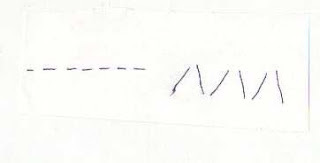 Remember how to do blanket stitch? 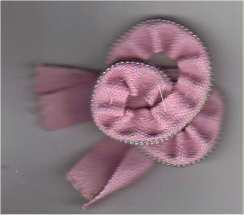 You can use yarn, ribbon or embroidery thread for the blanket or buttonhole stitch on fleece. Once you have the binding around the edge, embroider a design in a corner -- an initial monogram or something that shows you made the gift especially for the person. You'll be one gift ahead, and you didn't even have to fight the crowd to shop! Fleece has taken the crafts market by storm, but felt is an old standby. 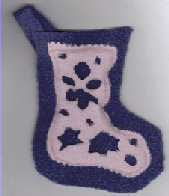 If you like crafts that do not require much sewing, felt and fleece are ideal because they do not fray. However, fleece does not produce the same result as felt. The feel of fleece is an improvement over the feel of felt, but felt has been around for years and works well for crafting. Why use felt when fleece feels best? The answer is in the crispness of the fabric and the way it is made. Fleece has a center layer of foam and when cut, the edges are not crisp. Using a crafts project made with fleece creates more fraying or feathering of the fleece fabric. 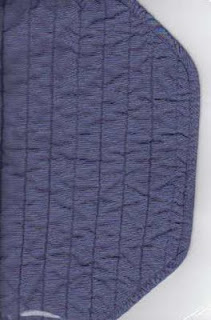 Fleece is heat sensitive because of the foam center in the fabric. Use care if you attempt to press fleece. Felt holds up better for small crafts. 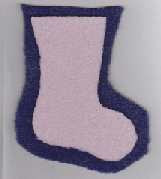 Fleece is a good fabric for large projects such as scarves or even baby throws, but is not as good for, say, making a snowman applique for a Christmas stocking. We have some fleece books and patterns available on a selling site if you need ideas. Copy and paste this link to get to the fleece items. Felt has been available for many years and there are some excellent patterns. Felt patterns are available for sale as well, but you will need to copy and paste the link. Fleece does not work well for applique work with layers of fabric as it tends to get thick with just two layers. Sometimes you can use fleece best with cut-out designs. 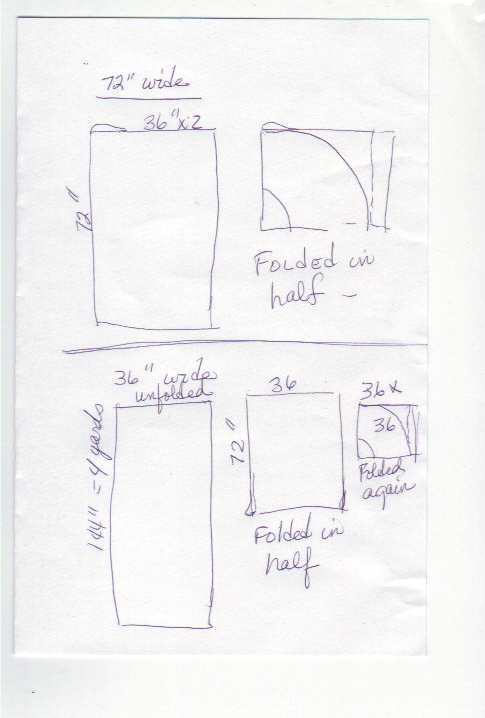 Here’s how to make cut fleece designs. Make your background shape with fleece first. 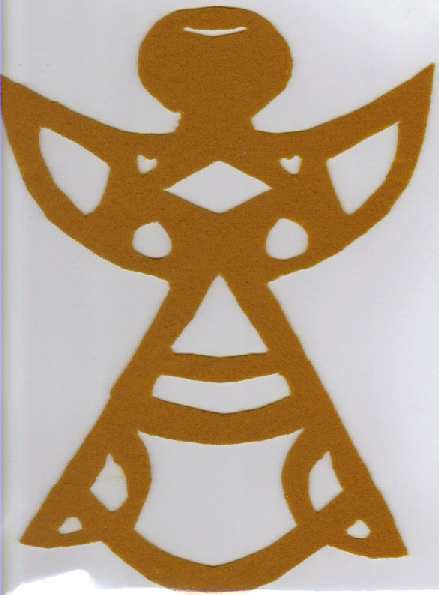 Cut a second shape slightly smaller than the background with a contrasting color of fleece. 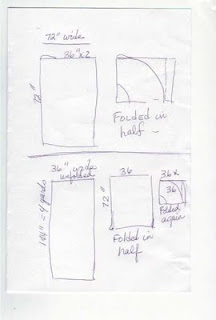 Cut out designs in the second shape before you stitch the two pieces together. Fleece is fun and easy to work with, and you just need to design the work to accommodate the fabric capabilities. 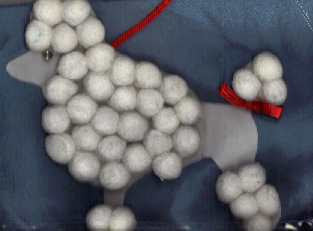 Cut-outs are one of the ways to use fleece for your Christmas projects this year. See you next time with more needlework crafts! 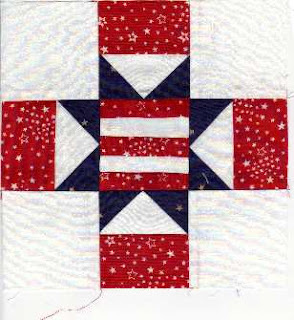 In 1976, a patriotic quilt pattern was published with a block for each of the 50 states, and many "state" quilts have been made based on those blocks. The original blocks came from "Hearth and Home" Magazine from 1907 to 1912. These patterns are interesting, but some are difficult -- for example, the Texas star is in a circle. This book is called "The United States Patchwork Pattern Book" and I believe it is still available. I have the 1976 version. Even if you don't have this old pattern or the skill to make the squares as designed, you can make a patriotic quilt with blocks in designs you like. To make it easier, make certain that the blocks are all the same size or add stripping to the blocks to make them all the same size. Then I made a pinwheel in red and blue on white. The pinwheel squares are 4 inches and the triangles are about 2 by 3 1/2 inches. The final design uses 3 inch squares and came out to the 8 inch size that will be 7 1/2 inches square when an outer edge is added. I started with 5 strips in alternating red and white, one inch wide. I stitched these so they are 5/8 inch wide, so the seams are about 3/16 inch. That's the center square. 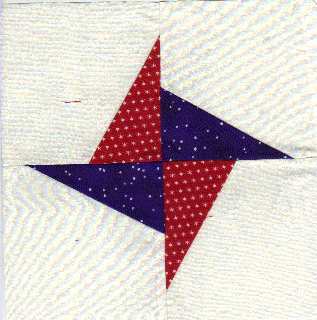 The pennant squares have red pieces that are half of the square, or 1 and 5/8 inch by 3. The other part that is 1 5/8 inches by 3 is made of one white triangle and two blue ones. You need four of these triangle squares and 4 plain white squares. Assemble the three dark squares across first, then assemble the two whites and the triangle square for each side. Before you put them together, press and pin at each seam edge to make certain they fit. Restitch if necessary. I got the hang of it by the second one, but this is more detailed than you have to make and it is a little tedious. 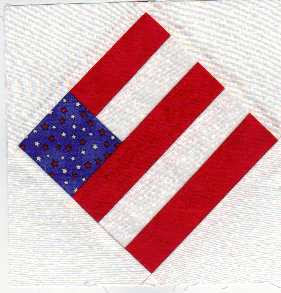 If you are tired or don't like making these patriotic quilt blocks at this point, make a pillow -- don't just give up. If you have two or four blocks, you can make a 16 inch pillow front. Put a red or blue strip between the blocks and add a blue block and a red block with no design if you only made two blocks. Add batting and backing and quilt if you want. Use your imagination. 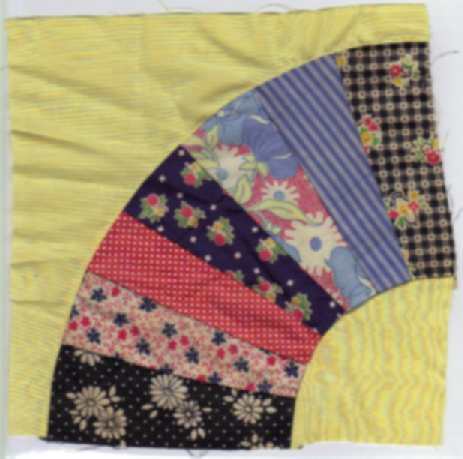 We are still in the heat of summer in Texas, and quilting blocks are small and crisp to work with. I'm not crocheting afghans again until winter. Pillows add to the finished look in a living room or bedroom, and they are fun and easy to make. You can repurpose or recycle and make an easy pillow. You need no zipper when you use a shirt with buttons. You only need an old shirt, a pillow form or fabric and stuffing for an inner pillow, and a needle and thread to make this nifty recycled pillow. Choose a shirt -- mens or womens. The larger shirts make larger pillows if you choose. Lay the shirt flat with the front side up and all buttons buttoned. Measure from underarm to underarm and see how large you can make a pillow. Pillows are usually square, and it takes a 17-inch square to make a 16-inch pillow. Use a 15-inch square for a 14-inch pillow and a 13-inch square for a 12-inch pillow. Pillow forms are available in 12 inch, 14 inch and 16 inch sizes, but you can make the pillow any size and fill it with loose filler, quilt batting or even old pantyhose if you choose. If you use loose filler or pantyhose, make an interior liner of muslin or a solid-color fabric that is about the same size as the outer form. Sew around the liner, leaving about 10 inches open. Turn the liner right-side out and fill with stuffing. 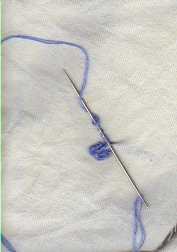 Close the opening with hand or sewing-machine stitches. Back to the pillow: Mark the odd-size measurement (13, 15, 17 inch) on the fabric as high up under the arms as possible. Measure down the front to make a square in that size. Pin the front and back layers of the shirt together inside the square you have drawn on the front of the shirt. Cut through both layers to form the square. 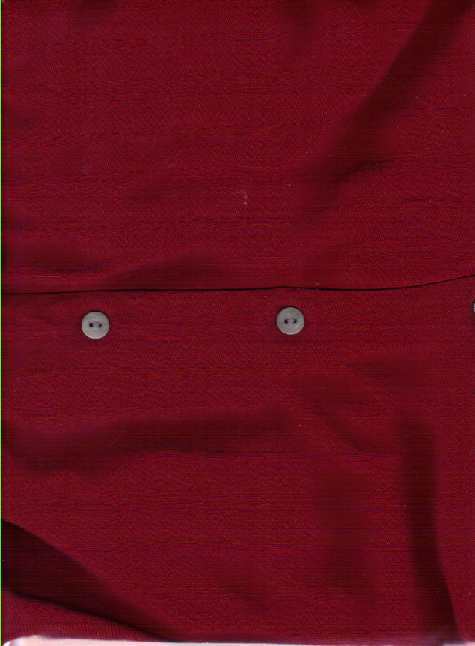 Use fabric or embellishments to decorate the right side or surface that was once the back of the shirt. 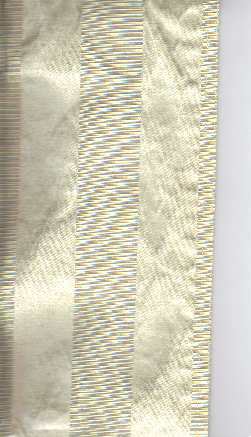 Turn the right sides of both of the fabrics inside and sew around the outside edge, using a half-inch seam allowance. Unbutton the pillow top to turn the fabric. Fill your shirt pillow with a pillow form or the liner and stuffing of your choice. Button the buttons. You can use the button-up side for the front or the back of the pillow. Use your own creative ideas for decorating one or both sides. Sewing notions accumulate, and I have more zippers than I intend to use in this lifetime. 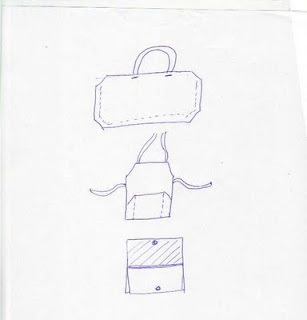 Zippers are available at thrift stores or in the sewing box of anyone who sews. Zipper flowers have been floating around the crafts markets for a few years but I had not tried to craft them until this summer. I sew all of these crafts, but gluing might work for you. I don't like the effect of the glue, or the permanence. 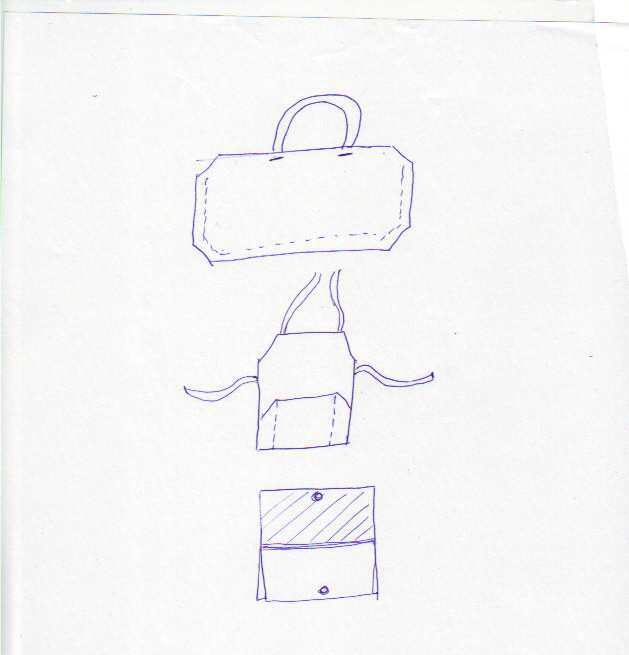 I want to reuse the zipper pieces if I don't like the result. A longer zipper makes a fuller flower. Cut the stop at the bottom if it bothers you. I left the stops on these samples. If you leave the stop on the zipper, unzip the zipper to the bottom before you start to sew. Thread a needle with quilting thread or something strong enough to gather. Start at one end and tack with a few stitches. Make a stitch like the zigzag about 3/4 of an inch apart. When you get to the zipper stop, you are in the middle of the zipper. Continue with the zigzag stitching to the end. 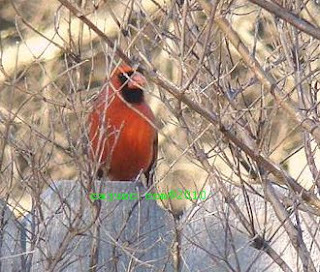 Pull gently on the thread to gather. Roll your flower from the end where you started sewing. Tack the end with a couple of stitches when you have the stitching pulled as tight as you want. Experiment with other methods. 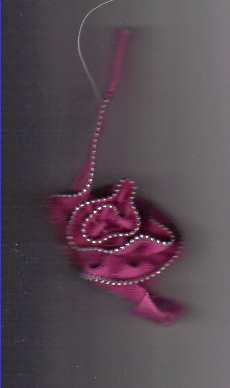 The pink zipper flower is made by stitching the sides of a closed zipper with a straight stitch. 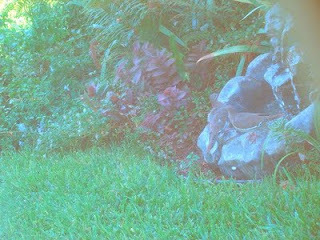 The light gathering creates the circles for the three-petaled posy. 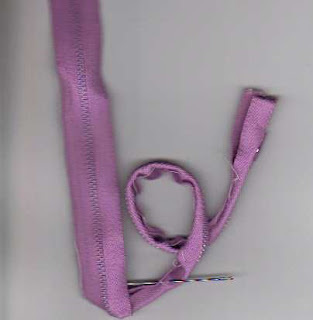 The purple zipper is closed to start and the sides are whipstitched together at the back of the zipper teeth. Use felt the same color as the zipper or white to cut a 50-cent size circle to sew the zipper flower in the shape you want. Add a safety pin to the back to make it removable or stitch it to a fabric purse, a sweatshirt or a wallhanging. Consider other uses for this recycled crafts project. I've missed you guys! I've been working on a writing project that had to be completed by the end of June. So glad to get that done and back to fun! Cut the approximate shapes for the felt flower. The petals are about 3 1/2 inches in diameter and the leaves are about 5 inches. The felt is standard weight, not the heavy stuff. 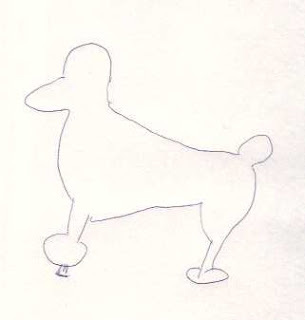 The dog bone shape is 8 inches long. Once you have the pieces cut, cut an X in the center of each of the four smaller pieces, but not the dog bone. Fold the dog bone in half. 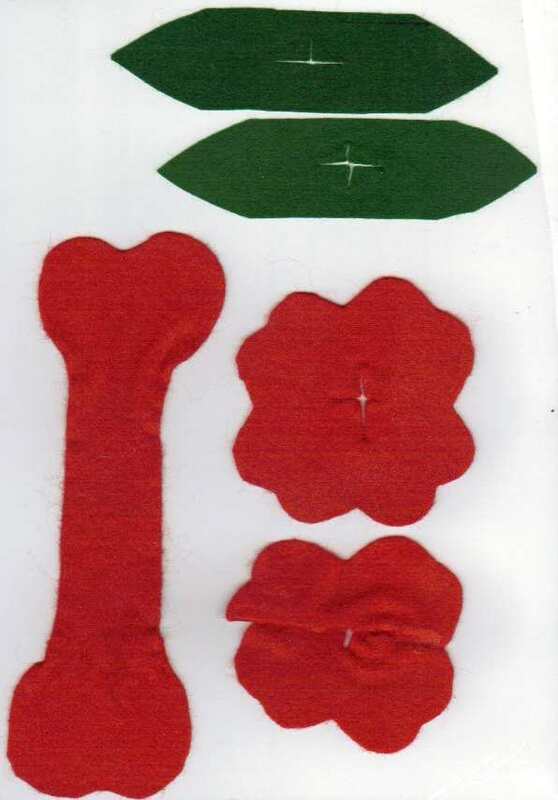 Slip a section of flower petals on the dog bone with the use of the X cut in the center. Add the next section. Add a leaf section. Add the next leaf section opposite the first one. 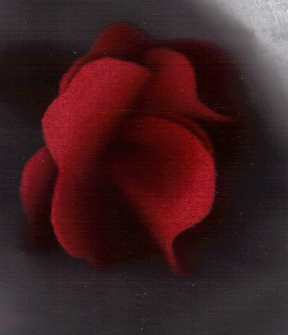 Your felt flower is complete. You can use it on a package, or make more for a bouquet. This may work for fleece as well. I'll try some others and let you know! 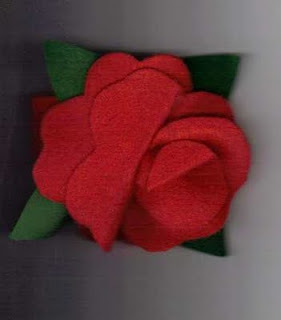 These felt flowers are so easy to make, kids old enough to use scissors can learn how. We're moving the blog, but you will still be able to follow it or read when you want. This will give it a new name -- myneedleworkcrafts.com. This is a yarn baby afghan. Crocheting a baby afghan takes much less time than an adult afghan. Just get a crochet hook in a large size and get started with a skein of yarn. If you like it, make a baby afghan for a gift. If you have tried making an afghan and had difficulty keeping it square, start with one size larger hook for the chain and first row, then go to the size hook recommended for the pattern. We have lots of inexpensive crochet books and crochet patterns available for sale and there are lots of other sellers online. 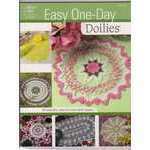 You don't have to buy new to have fun with needlework.